ZIMBABWE – Lupane, Zimbabwe (Thomson Reuters Foundation) – When Thabiso Dube isn’t helping his mother at home, the scrawny 8-year-old is working alongside her, doing odd jobs in exchange for food. He should be in class, but has virtually dropped out of school because he is always hungry, said his mother Sithandile Dube, of Lupane district in Matebeleland North province. Thabiso only goes to school “if he has the strength,” she says – which can be as little as once a week, usually when there is enough to eat at home. “We haven’t had enough (food) for a long time. Our crop failed. That’s why now I have to work for other people,” she said. Over the past five years, Zimbabwe’s two Matebeleland provinces and the country’s Midlands have been suffering from a disastrous mix of erratic rainfall, flash floods and long dry spells. In a country where 80 percent of maize – the national staple – comes from the fields of small-scale farmers, the extreme weather has severely depleted stocks of food in many homes – and schoolchildren are bearing the brunt of the shortages, experts say. In October, Matebeleland North provincial education director Boithatelo Mguni issued a statement saying that up to 6,000 children across the province are dropping out of classes because of they are too hungry to attend. According to Sithole, the effect of Zimbabwe’s food shortage became clear when schools started in September. Nurses at one Lupane clinic said they are getting an increase in the number of children losing unhealthy amounts of weight because of lack of food. According to the Commercial Farmers Union, Zimbabwe produced 1.4 million tonnes of maize last year, far short of the 2.1 million the country needs. With Zimbabwe again battling drought, experts predict maize production could dwindle even further. Zimbabwe’s government and non-governmental organizations have put into action plans to tackle the food shortages, but not all of them are proving effective, experts say. In September, President Robert Mugabe announced that the government is importing maize and mobilizing food aid, promising that no one in the country would die of hunger. 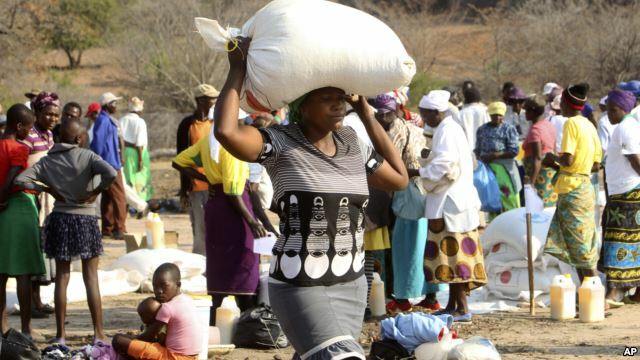 But in a statement on Oct. 9, United Nations resident coordinator Bishow Parajuli said $132 million is still needed to secure food assistance to 1.5 million hungry Zimbabweans. In Lupane and several drought-hit districts in Zimbabwe’s southwest, children’s charity World Vision International and the UK’s Department for International Development have together launched a scheme that gives families vouchers to redeem for groceries at designated outlets. “We want children to benefit from this assistance,” said Khumbulani Ndlovu, World Vision Zimbabwe’s integrated programs manager. To ease farmers’ reliance on rain to grow their crops, Zimbabwe’s vice president, Phelekela Mphoko, announced recently that the government aims to try to rebuild Zimbabwe’s largely collapsed irrigation infrastructure. Zimbabwe also has received a $99 million farm equipment loan from Brazil under the South American country’s More Food for Africa initiative. However, Zimbabwe’s agriculture minister said farmers will have to pay for the equipment – which includes tractors, planters and fertilizer spreaders – effectively excluding poor rural farmers. Critics say lack of equipment is not the key problem and the government should focus on finding ways to ease the impacts of Zimbabwe’s increasingly unpredictable climate on families like Dube’s. “We can only hope for rains so we can plant our own food,” she said.